The First Amendment never “shuts down.” … The [FAA Act] subjects Atlas to criminal penalties should it ship beer with unapproved labels in interstate commerce. But Congress has not enacted legislation funding the issuance of [COLAs] for beer labels at the present time. There is no telling whether or when such legislation might be forthcoming, or how long it might take the government to approve COLA applications should funding for this activity be someday restored. Atlas does not seek a mandatory injunction to reopen the COLA function. It does not seek the redirection or appropriation of any federal funds. It raises no challenge to the COLA process itself, or to any of the standards the government would apply in licensing beer labels were the government back in the licensing business. Rather, Atlas’s propositions are simple: It cannot be denied the right to speak for lack of meeting an impossible condition. The right to free speech is not a favor that the government affords Americans when political circumstances allow. Moreover, the COLA requirement, a content-based prior restraint on speech, is currently unconstitutional because the licensing authority withholds permission indefinitely. Under these circumstances, the COLA requirement’s enforcement must be enjoined. Atlas Brew Works expresses itself through the labels it places on cans and kegs containing its beers. … Beer labels are a form of expression protected by the First Amendment. The government can shut down speech regulators. It cannot shut down the First Amendment. This Court may be unable to solve the political branches’ budgetary standoff, but it remains in the business of securing fundamental rights. 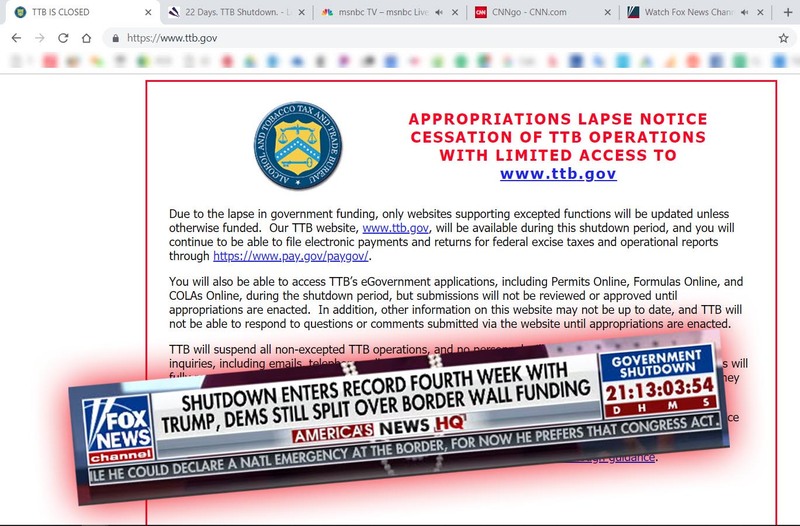 On December 22, 2018, the Department of the Treasury (including TTB) was partially shut down due to a lapse of appropriations. … As a result, approximately 90 percent of TTB’s employees were placed on furlough, i.e., in a non-work, non-pay status, pursuant to TTB’s shutdown plan … . In accordance with the designated TTB shutdown plan, none of the functions in the Alcohol Labeling and Formulation Division, including reviewing applications for label approval, is considered “excepted.” … Accordingly, all employees assigned to that division were placed on furlough and, in accordance with the Anti-Deficiency Act, must stay away from the work place and may not perform government work. 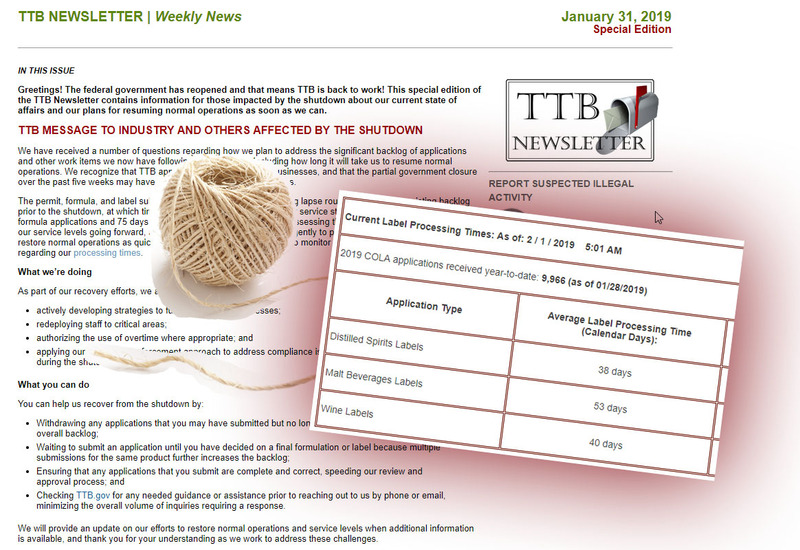 … As of the date of filing of this brief, TTB remains unfunded and its employees thus may not review or process label applications at this time. 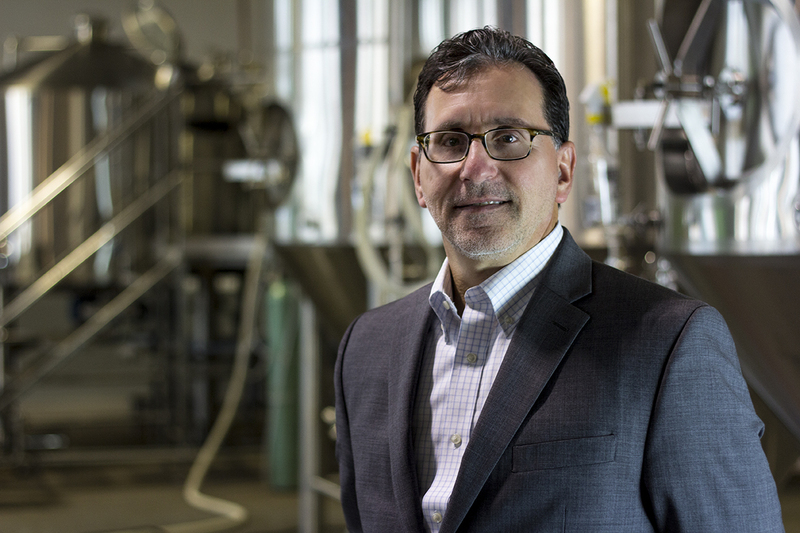 … Once TTB receives funding, it will resume its review of applications for label approval. Accordingly, Plaintiff’s activities constitute nothing more than self-inflicted injury, to the extent that Plaintiff has even suffered injury, and fail to establish irreparable harm. Even were Atlas to reconfigure its PRECIOUS ONE can label for keg use, it would still suffer significant First Amendment harm in being unfree to speak as it wishes with respect to this product. Using an undesirable label for one beer alleviates neither the First Amendment injury with respect to that product, nor the First Amendment injuries with respect to all the other products which cannot obtain any label approval at all. Atlas is principled, but not impractical. Atlas would take whatever action necessary to mitigate its damages—but doing so would not undo the injury to its constitutional rights and the rights of its consumers. Atlas wants to publish its label, designed to communicate with its customers, not some other label designed by government lawyers seeking to avoid an injunction. If the government threatened the Coca Cola Company with prosecution for selling red cans, insisting instead on green cans, the Company might well resort to selling Coke in green cans while it seeks injunctive relief for its First Amendment injury. Likewise, book publishers and movie studios, whose products are inherently expressive, would be heard to object to censorship on First Amendment grounds, even if their primary motivation would be the protection of their commercial interests. But the government cannot censor books and movies, and claim that there is no First Amendment injury because the publisher remains “free” to sell the censored work. Atlas appreciates that the TTB might want to assist brewers in mitigating the shutdown’s damage. 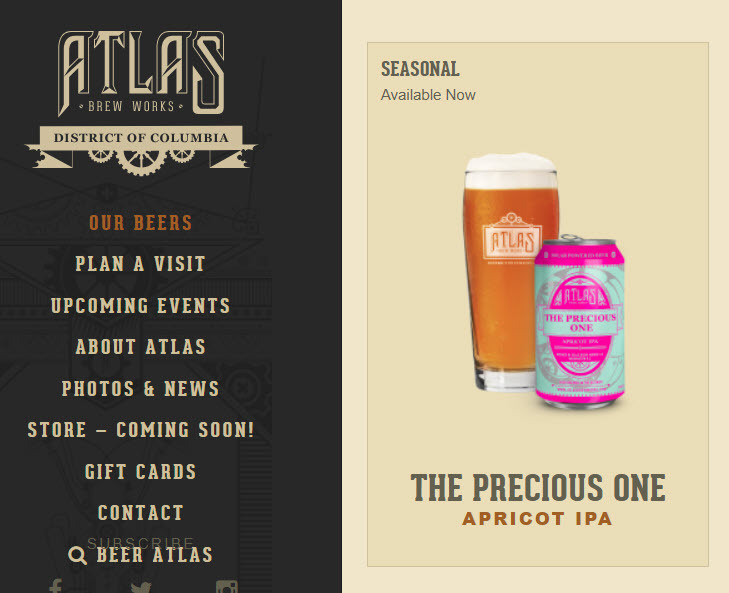 Atlas might well take advantage of Ms. Scalese’s proposal and concoct a rudimentary and unsightly keg label scavenged from its approved can-specific label, lacking Atlas’s trade dress and standing inconsistent with the rest of Atlas’s lineup, if that is what it would take to avoid a complete loss of the beer destined for interstate shipment. But it would not be speaking freely. This case seems to be on a very fast track. The last hearing was two days ago, and it seems like the court could make some decisions any moment. Unless more parts of the government run out of cash first. Doesn’t there seem to be a bit of grey area around the term “interstate” as Washington DC is not recognized as a state? Obviously sales outside the geographic boundaries of DC proper could not be called intrastate commerce elsewhere. While it does not obviate the need for an approved/compliant label for an alcohol product, it seems there may be another avenue to pursue besides the free speech aspect Atlas is currently pursuing.